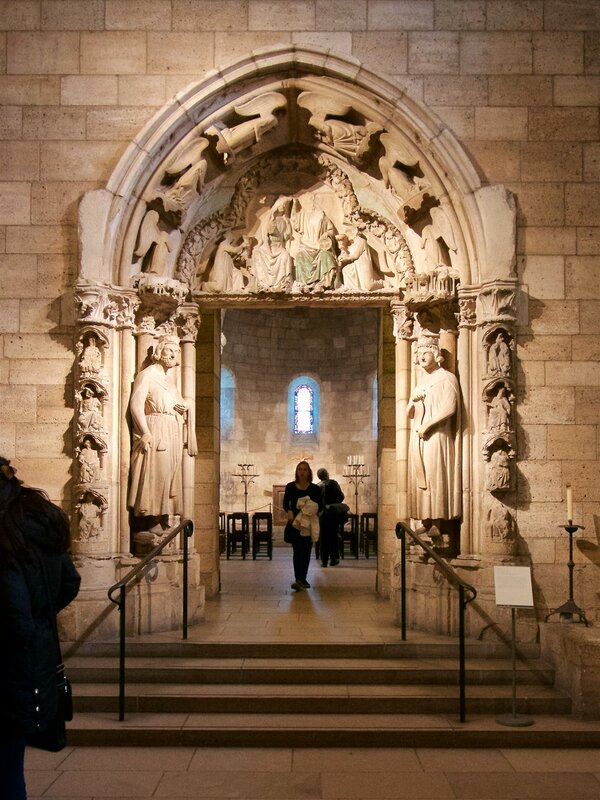 We went way uptown to walk around the Cloisters and said goodbye to Marion and Lester, going to a hostel in Harlem. Once again we were going to a museum that didn't open until 10am, but since it would take us about an hour to get there, we got up a little early. Lester woke up a bit before we were about to head out, and since we wouldn't see him in the afternoon, we said our goodbyes and headed out the door. 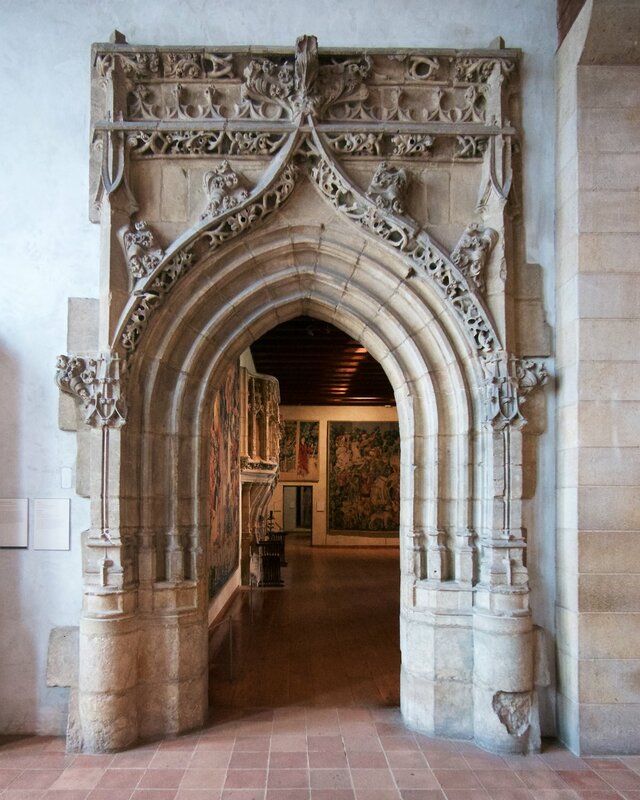 The Met Cloisters is pretty far uptown, and it would take us about an hour to get there, even with an express train. After we got out of the subway, we walked up the hill of Fort Tyron Park, up to the museum. 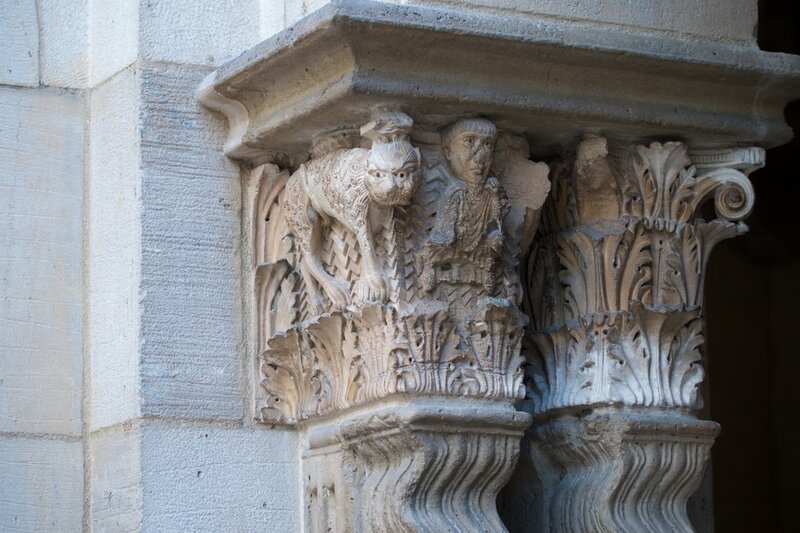 As one would think by the name, the Cloisters shows work of medieval Europe. A cloister is a quadrangle of arcades running around buildings. 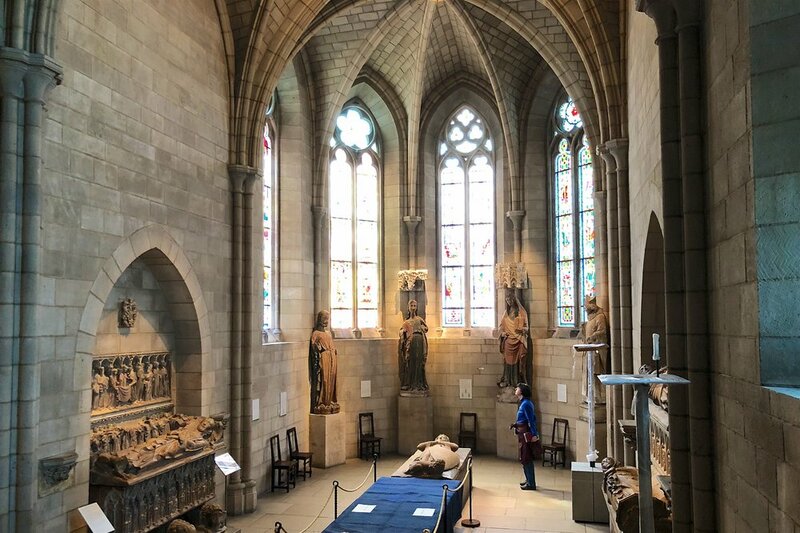 There are three such cloisters at the museum which surround gardens, and a fourth which is open on two sides so you can see out over the Hudson River across to New Jersey. That view across the river is of cliffs and shoreline, not buildings, because John D. Rockefeller had donated 700 acres of the Palisades' plateau to preserve the view. 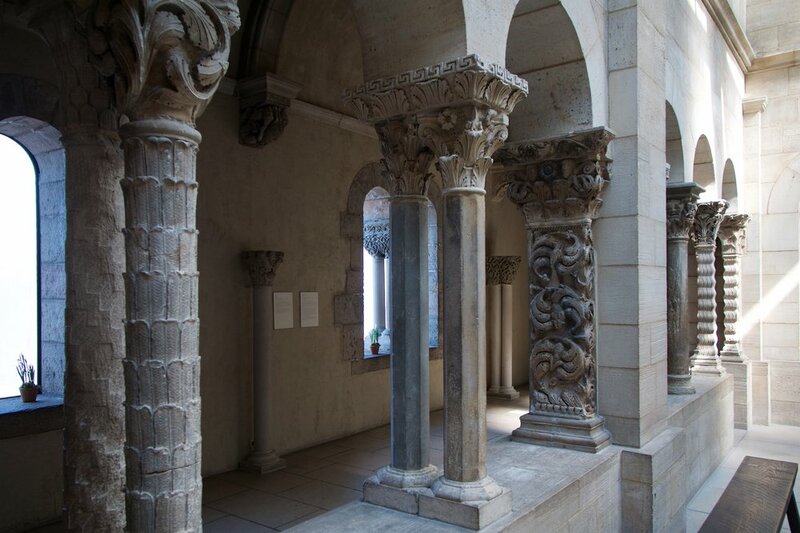 He also donated the then-named Barnard's Cloisters and most of its contents. We got audio guides and started our way through the museum. All sorts of work are on display. You would expect tapestries and sculpture, but we also saw arches, columns, capitals on top of columns, stained glass windows, and tombs. 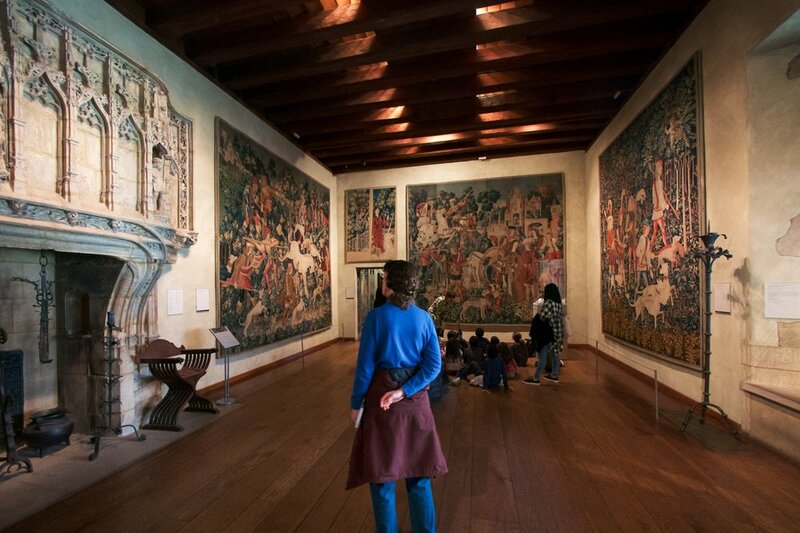 Probably the most famous room is the Unicorn Tapestries Room, which has a series of seven tapestries named The Hunt of the Unicorn from the late 15th/early 16th century. 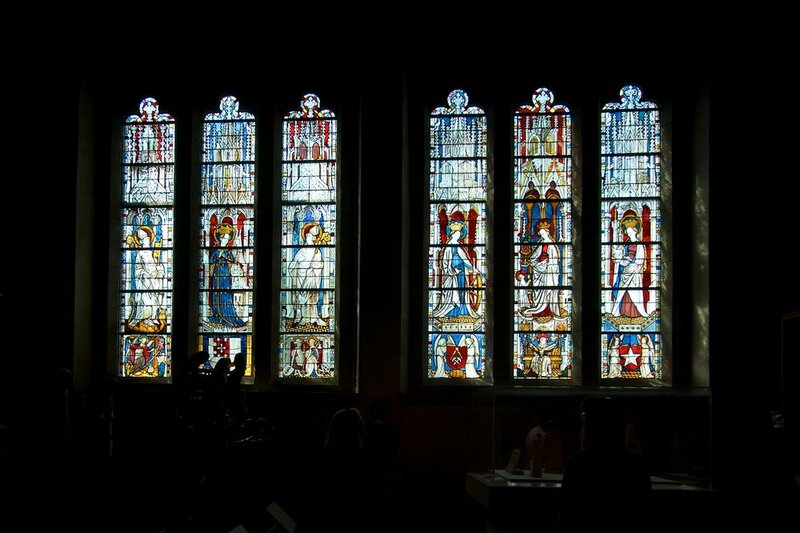 Downstairs, the Gothic Chapel has the classic shape of a rectangle with one rounded end which included stained glass. 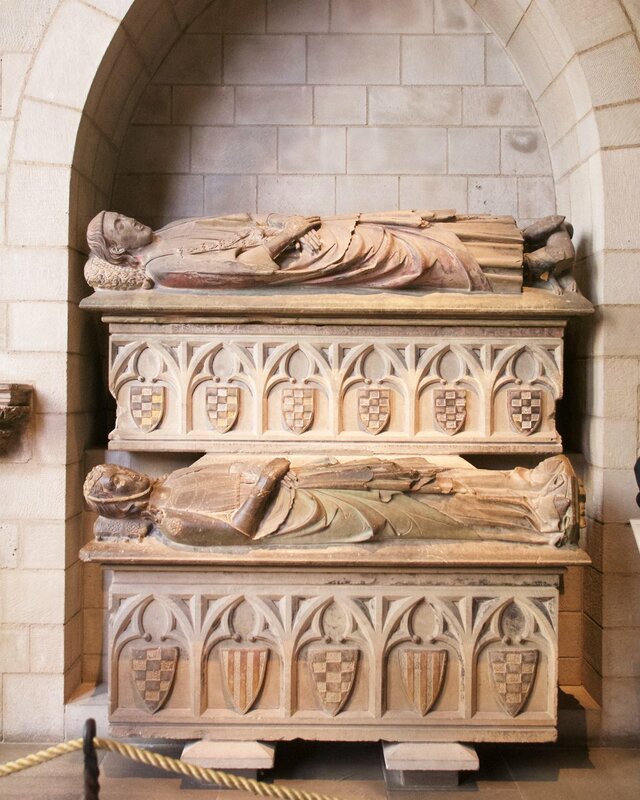 There were some tombs on display there, as well as sculptures. By the time we finished going through the museum, it was time for lunch. We decided to try a Dominican restaurant and ordered a lunch special. It ended up being a lot of food, but we still managed to finish most of it. It included fried plantains which were a really good way to end the meal. We then went back to Marion's place to say goodbye to her and get our bags. We met up with Celeste by the subway, and she went with us up to Harlem to find our hostel. It's in a brownstone, and our room was on the third floor. The woman who showed us in was very chatty and all the great information she gave us came at a fast and furious pace. Things in this hostel are very delineated. Normally, you put your food in a bag, label it with your name, then put it into communal areas. You use communal utensils, dishes, and glasses. Here, there are still communal utensils, but the cabinet is divided by rooms and your dishes are there. The fridge is split by room, too, so you put your things on the appropriate shelf. It was about dinnertime, so we went a few blocks away to Whole Foods to get stuff from their deli. That store has the same line setup as the Union Square store with the display showing you which register you should go to, but there was no express/regular split. Looking around, not many people had more than fifteen items anyway, so they probably knew that when they set up the checkout counter. After we finished eating, we said good night to Celeste then went back to buy breakfast items. We got back to the hostel, put our things away, and settled in for the night.